Churchill III tank of 'Kingforce' during a break of conflict, the Second Battle of El Alamein, 6 Nov 1942. Canadian Churchill tanks during Exercise ‘Spartan’, 9 Mar 1943. IWM photo H 27922. Canadian infantry riding on a Churchill III tank during Exercise 'Spartan', 9 Mar 1943. IWM photo H 27924. Churchill IV tank enters a village during Exercise ‘Spartan’, 9 Mar 1943. IWM photo H 27928. A Churchill tank, possibly of the 51st Royal Tank Regiment, is given a final check in a harbour area of Italy. IWM photo TR 2017. Ammunition being passed into the turret of a 25th Tank Brigade Churchill supporting the 1st Canadian Division, 17 May 1944. This was the first use of Churchills in Italy. IWM photo NA 14974. 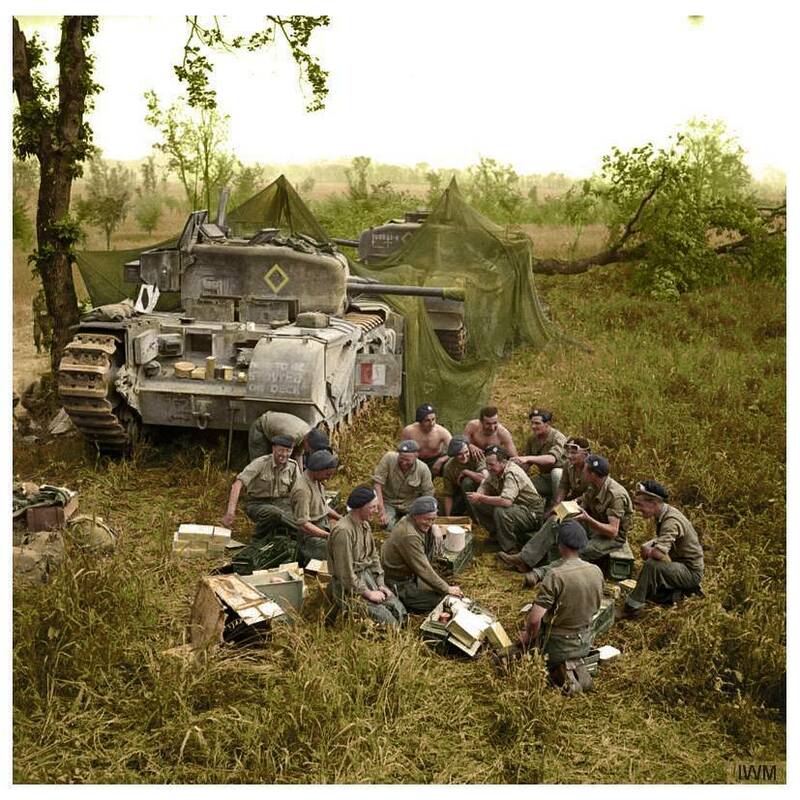 Churchill tank crews HQ Troop, 51st Royal Tank Regiment, 25th Tank Brigade, share out rations near their camouflaged vehicles before going into action in support of 1st Canadian Division. Italy, 17 May 1944. IWM photo NA 14976. 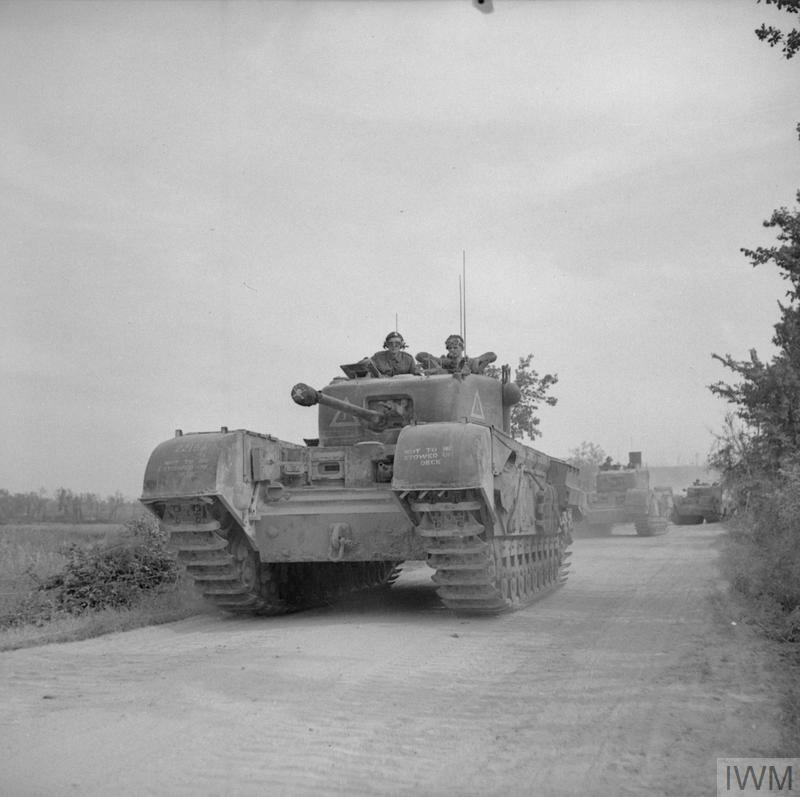 Churchill tanks of 25th Tank Brigade going forward to support 1st Canadian Division, 17 May 1944. IWM photo NA 14981. Churchill VI of the 4th Battalion, Grenadier Guards, 6th Guards Armoured Brigade, advancing towards St. Pierre Tarentaine, France, 1944. Churchill tank of 3rd/4th County of London Yeomanry, North West Europe, 1944. National Army Museum photo 1975-03-63-19-51. Tank and infantry officers confer on a Churchill tank of 7th Royal Tank Regiment, 31st Tank Brigade, during Operation 'Epsom', 28 Jun 1944. IMW photo B 6113. A Churchill tank of 7th Royal Tank Regiment, 31st Tank Brigade, supporting infantry of 8th Royal Scots during Operation 'Epsom', 28 Jun 1944. IMW photo B 6124. 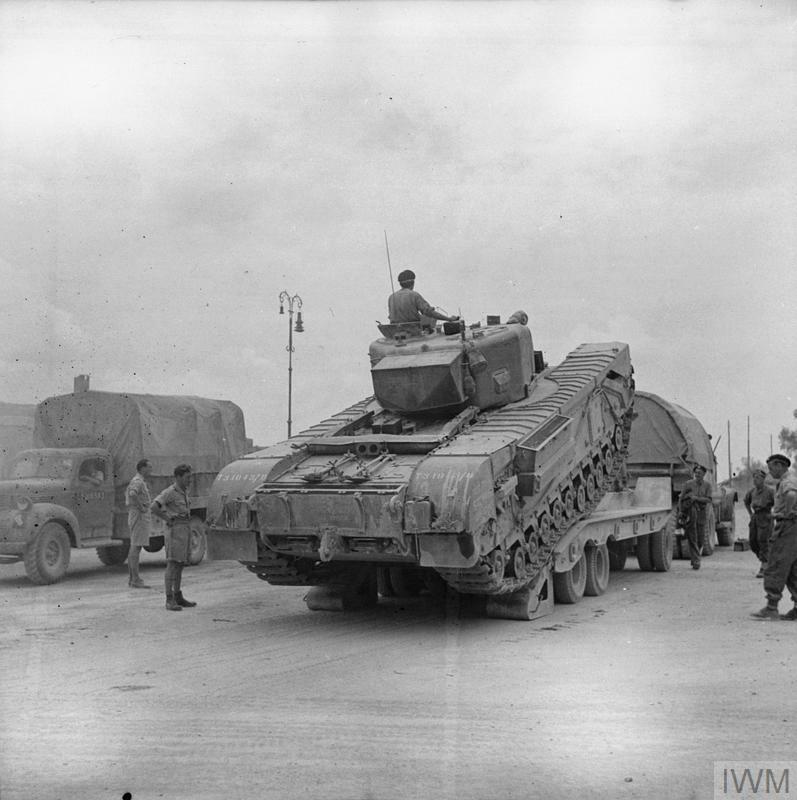 A new Churchill tank being unloaded from a transporter. Arezzo, Italy, 19 Jul 1944. IWM photo NA 17040. 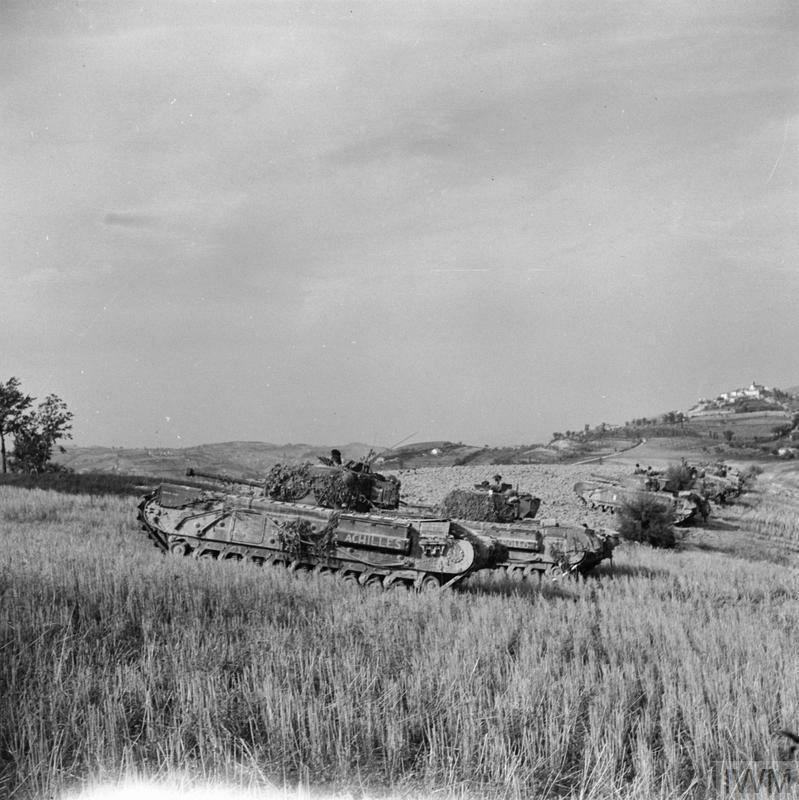 Churchill tanks of 51st Royal Tank Regiment near the River Foglia, 30 Aug 1944. The tanks were supporting infantry of 139th Brigade attacking across the river. IWM photo NA 18129. A Churchill tank leads a troop of Sherman flail tanks of 79th Armoured Division during the assault on Boulogne, Sep 1944. A French sailor can be seen manning the radio in the Churchill, guiding the vehicles towards their objective. IWM photo HU 104161. 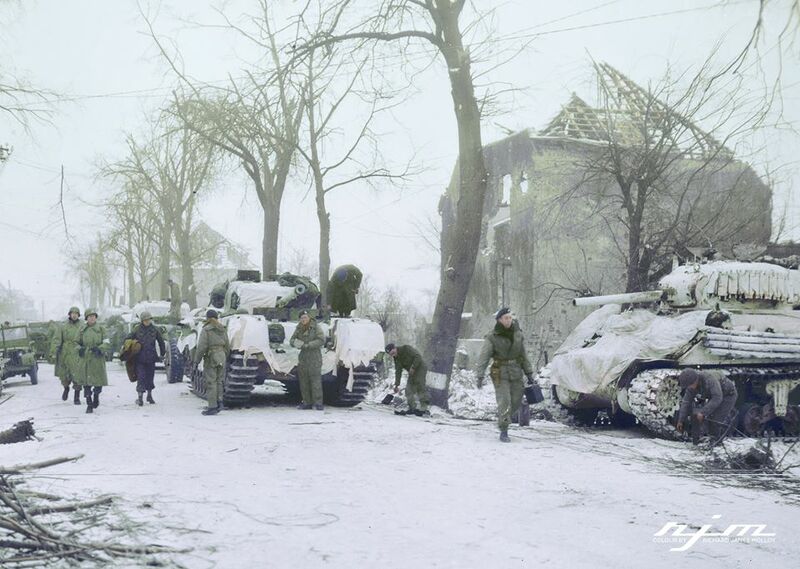 Churchill tanks of 34th Tank Brigade north of Geilenkirchen, Germany, Dec 1944. The scout car on the left has the '156' unit serial indicating 107th Regiment RAC. IWM photo EA 47337. A Churchill tank of 147th Regiment, Royal Armoured Corps, 34th Tank Brigade, advances along a road near Geilenkirchen, Germany, Dec 1944. IWM photo EA 47338. Units of the US 9th Army and a Guards Unit of the British 21st Army Group preparing for an attack on Brachelen, Germany. 26 Jan 1945. A column of Churchill tanks move along a devastated street in the town of Kleve, Germany, 12 Feb 1945. IWM photo B 14513. 6th Guards Tank Brigade Churchills carrying paratroopers of the 17th US Airborne Division, Germany, 29 Mar 1945. IWM photo BU 2737. Note the front soldiers with captured MP-44 assault rifles. 17th Airborne Division paratrooper gets a light from a Churchill tank crewman of 6th Guards Armoured Brigade near Dorsten in North Rhine-Westphalia, Germany, 29 Mar 1945.